I journeyed to the magical canadian town of Tofino British Columbia on Vancouver Island to celebrate my sister's bachelorette party. Let me preface this by saying – you have got to go to Tofino! Amanda knew she was going to Tofino for the weekend, but she had no idea that our plans were to stay in a luxury cabin right beside Tonquin park. She was greeted at the door with a glass of wine (her fav) - I love looking at the pictures of Amanda entering the cabin and being amazed by our accommodations for the weekend. You would understand if you saw the view from the balcony, which overlooked Feliece and Clayoquot island on the Pacific Ocean. The balcony even had a hot tub. So naturally, on our first night there we watched the sunset from our balcony in the hot tub. First thing the next morning, while sitting inside having breakfast, we saw a Bald eagle fly by our window, and a baby seal in the water below! The entrance to Tonquin park was a two minute walk from our cabin. The boardwalk to the beach is beautifully done. At some point we were able to see our cabin from the lookout point. It was so stunning. The green enchanted forest. Trees bigger than my arms. The moss covered landscape. Its the perfect pacific west cost destination. I felt compelled to do double exposure photographs of the group members, so I did! Beautiful ladies in nature, what more do you need! Later we explored the town of Tofino, descending to Tofino Brewery Co. I decided to leave my camera home, so we used Amanda's Polaroid camera, and the pictures turned out great. To be honest,I actually regret not taking a photograph of all the polaroids on my camera! There must have been at least 60 polaroids, and they are hilarious! The photographs from the weekend were picturesque so I wanted to share my experience on my blog! I would love to share all the images from this trip, but some things should stay in Tofino ! I had a great time with my sister and her friends. I am humbled by the amazing, caring, loving friends my sister has in her life. From the coordinating to the polaroids, it was all perfect. More importantly, we are all looking forward to Amanda's wedding in Victoria , British Columbia this May! My mama invited me to go to an event called Dîner en Blanc. I quickly made the decision to go as I've heard great reviews about this event. I was excited to be part of this spectacle and it certainly lived up to my expectations! Diner en Blanc involves a large group of people gathering together, wearing all white and dinning together in an undisclosed public space. Everyone who attends MUST where all white and bring their own dinning materials. The location not disclosed until last minute, so you can only imagine the suspense and excitement that was in the air! All attendees meet at the assigned location, load onto the buses, which take everyone to the secret location. 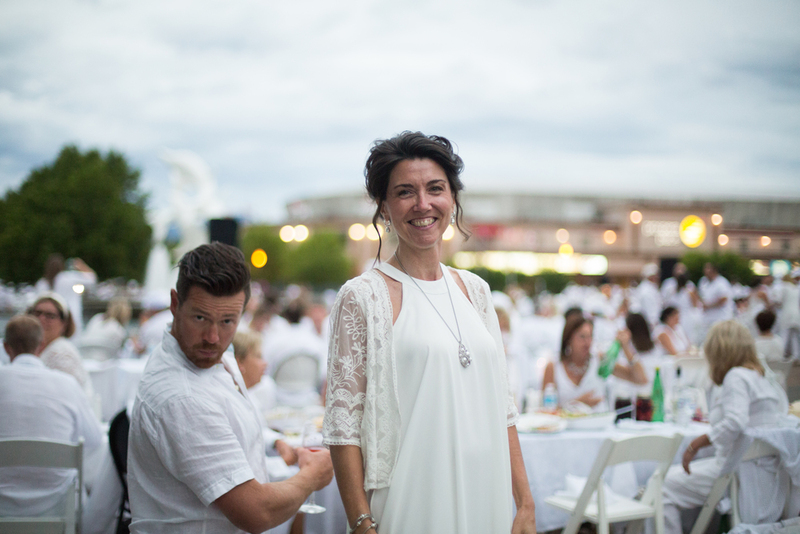 This years Dîner en Blanc was located at the Dolphins water front near the Grand Hotel. I essentially played paparazzi for my mom and I had so much fun doing so! I followed my mother and her friends around the event. I was extremely happy (and relieved) that I decided to bring my camera with me! What a wonderful event! Three women walking together at Dîner en Blanc. The official start to the event! Starts with waving our napkins in the air.